A partial look at what NOW stands between you and your Doctor - don't say we didn't try to warn you. 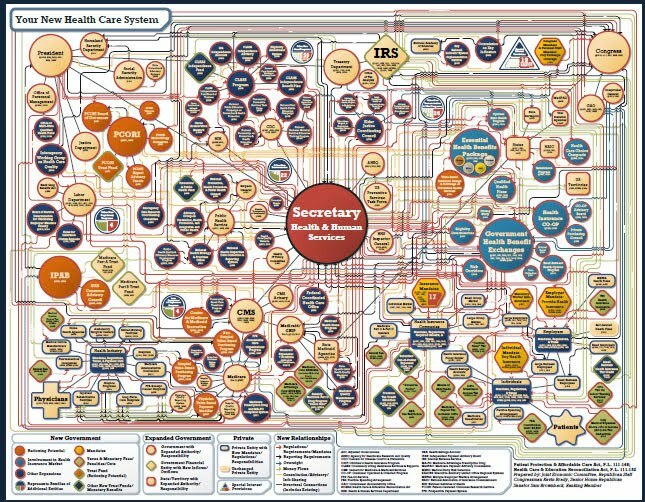 Washington, D.C. - Four months after U.S. House Speaker Nancy Pelosi famously declared "We have to pass the bill so you can find out what’s in it,"a congressional panel has released the first chart illustrating the 2,801 page health care law President Obama signed into law in March. 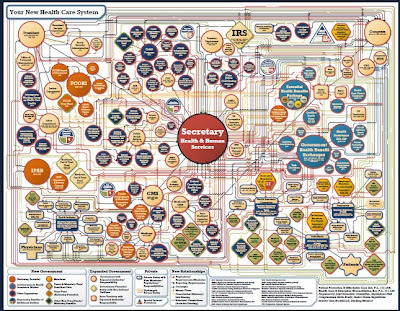 Developed by the Joint Economic Committee minority, led by U.S Senator Sam Brownback of Kansas and Rep. Kevin Brady of Texas, the detailed organization chart displays a bewildering array of new government agencies, regulations and mandates. "For Americans, as well as Congressional Democrats who didn’t bother to read the bill, this first look at the final health care law confirms what many fear, that reform morphed into a monstrosity of new bureaucracies, mandates, taxes and rationing that will drive up health care costs, hurt seniors and force our most intimate health care choices into the hands of Washington bureaucrats,"said Brady, the committee’s senior House Republican. "If this is what passes for health care reform in America, then God help us all." Brownback, the committee’s ranking member, added, "This updated chart illustrates the overwhelming expansion of government control over health choices and the bewildering complexity facing everyone affected by this law. It doesn’t take long to see how the recently signed health care bill causes a hugely expensive and explosive expansion of federal control over health care. Personal choices that should be between a doctor and a patient will quickly be strangled in a never ending web of bureaucracy." Senate Steering Committee Chairman Jim DeMint (R-South Carolina) called Obamacare "a bureaucratic nightmare. The Democrats’ takeover of health care creates a byzantine network of 159 new federal programs and bureaucracies to make decisions that should be between just the patient and their doctor. It should concern everyone that at the center of this regulatory web is the new CMS chief, Donald Berwick, who has championed rationing and European socialized medicine. Americans were rightly outraged that this big government bill was rushed through Congress before anyone read or fully understood the bill’s consequences. Republicans will fight to repeal this reckless takeover and to ensure health care freedom to American families." the creation of two new bureaucracies with powers to impose future rationing: the Patient-Centered Outcomes Research Institute and the Independent Payments Advisory Board. Brady admits committee analysts could not fit the entire health care bill on one chart. "This portrays only about one-third of the complexity of the final bill. It’s actually worse than this." 1)ObamaNation Shrugs Cost Effectiveness at it's Democratic-social-justice finest..
2)American Thinker- The Deadly Pact:How ObamaCare will save Money..."mercy death"